I have to do a posting JUST for BLT Prime’s popover bread. It’s out of this world, and I know this is a bold statement, but it is the best bread I have ever had. Yah, I said it. 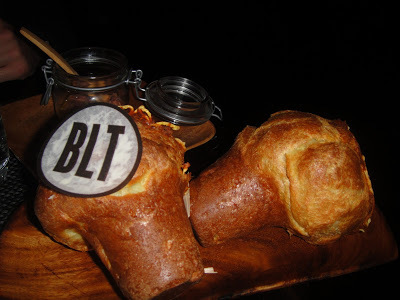 I’ve been to the one in New York City (Grammercy Park) a couple times for dinner, and everything at BLT is good, but their popovers are something to write home about. There are other BLT Prime locations as well. One in LA too! They bring the bread out on a tray with butter, and the recipe along with it because almost EVERYONE asks for the recipe. When you break the bread steam comes out of it. It is so fluffy and buttery, crispy on the outside and warm, soft/fluffy on the inside. There are no words to explain how amazing this bread is. I can make a meal out of it. Who needs steak after this? I’ve had the steak, oysters, all the side dishes, and the desserts on the menu, and everything at BLT is good, but their bread was honestly the best part. If you are on a budget and can’t afford a whole steak dinner, they have a bar area where you can sit and order drinks and appetizers and they will still bring you the bread. The bread is so filling you honestly will be satisfied with an appetizer and drinks. BLT has locations around the country, check out http://www.bltrestaurants.com/ for a location near you. Trust me on this one, this bread is off the chain!